I gave a talk on the PushButton Engine at the Flash Gaming Summit a few weeks ago, titled “PushButton Engine 101.” It is available online, thanks to Adobe’s kind support in sponsoring FGS and recording the sessions. You can view the PushButton Engine 101 talk here. It’s about 40 minutes long. People seemed to like it! If you have comments/questions/feedback, I highly recommend visiting the PushButton Engine forums thread about it. Other than the very early start, I thought FGS went a lot better than last year. (Perhaps because they had me on the advisory board – conference organizers take note! ;)) They had a solid tech track in addition to their business track. Maybe next year it can be two days – or just start a little later. More precisely, Eric Preisz and I wrote a book! 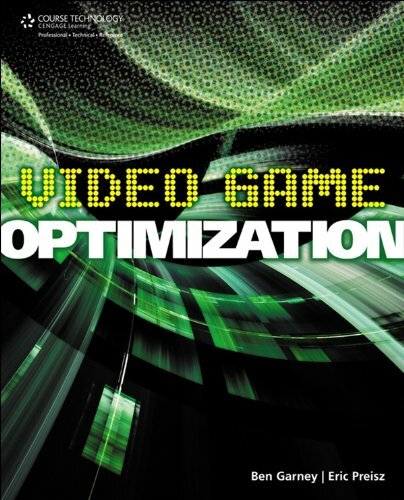 Video Game Optimization goes all the way from high-level concepts like planning for performance in your project’s timeline, to determining which broad area of your system is a bottleneck, down to specific tips and tricks for optimizing for space, time, and interactivity. Based on the course that Eric Preisz taught at Full Sail University on optimization, it isn’t the only book you’d ever want to read on the subject, but we think it is a great introduction! The journey from that initial conversation where our mutual friend Jay Moore introduced us and suggested I would be a good co-author, to the day when we finished and shipped the book was a long but rewarding trek. Eric moved across the country from Florida to Nevada, as he moved from teaching at Full Sail University to running the Tech and Tools group at InstantAction. He also became a father with the arrival of his son, Grant. I left after 5 years at GarageGames and helped build a new company, PushButton Labs. I spent some of my downtime over the past few months working on client-side brick physics for Blockland. The feature has finally been announced, so I can talk about it. The video shows off most of the features; the main one that isn’t shown is the interaction between players/vehicles and bricks; they will push bricks around but aren’t affected themselves. Watch it in full screen, it’s full 720p HD video. There were two big problems related to doing physics for Blockland. The first was the scale of the problem – there can be well over 100,000 bricks in a single server, which is beyond the capabilities of most physics SDKs to simulate as discrete objects. I started with PhysX, and moved to Bullet after realizing that the PhysX runtime is 80mb, far more than could be included in the Blockland download (which weighs in at 20 mb). Both of these libraries broke in different ways with large numbers of objects. At first, I implemented a management system for brick proxies, so that it kept them under the hard limit in the SDK (around 2**16). PhysX accepted this, but Bullet’s broadphase has some stuff that’s O(# objects) or worse, so it fell down. Eventually, I moved everything into the same system used for static world geometry, which was a grid of static meshes. It turns out that Bullet is a bit faster at creating these mesh objects than PhysX was. The static mesh cache took quite a bit work to get solid. Because the simulation is for aesthetic purposes, it can tolerate a fair amount of “fudge,” which I take full advantage of. Nearly every kind of update is timesliced so that only a little bit is done each tick. This keeps things smooth, even at the cost of the physical state being inconsistent for a tick or two. Most updates are lazy, as well, only done if a dynamically moving brick, player, or vehicle comes into the area. The other problem is the wide variability of Blockland user’s computers and usage patterns. Not every user has enough CPU to run physics. And every user has the potential to build something that is very resource intensive to simulate. I spent a lot of time implementing a “physics diaper” – logic to detect when physics calculations were taking too much time, and scaling back the simulation until it’s fast again. This takes two forms. First, if physics ticks are too slow, the simulation is decimated – every other brick on the list of moving bricks is converted to a lighter weight parametric simulation that doesn’t consider collisions. 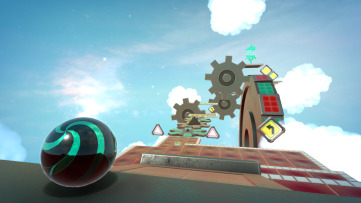 If they remain too slow, then eventually the physics simulation is disabled entirely, until the user turns it back on. This can help with very complex builds or very slow computers. Printed in Leonardo Times, Sep 2007 issue. Printed in Glimpse Magazine, Spring 2008 issue. Printed in “ROY G. BIV”, via Blurb. Used in Schmap for the iPhone. 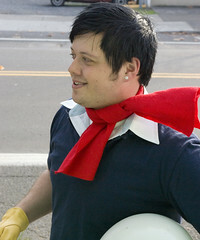 Used in a NowPublic post on the Speed Racer movie.